The Health Service Executive has said that a measles outbreak confirmed in Co Donegal last week is continuing and is urging anyone who believes they have the illness to contact their GP. There are three probable and several possible cases. 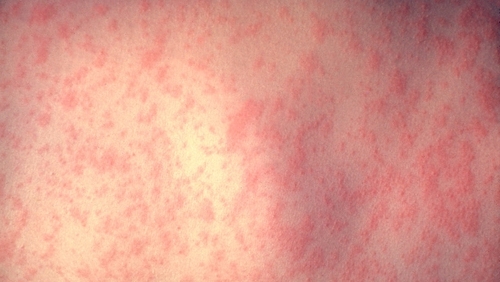 Given the fact that measles is highly infectious and can have serious complications, the HSE says it is very important that anyone with symptoms should avoid spreading it. Last week the HSE said that while the majority of children in Donegal still receive the measles, mumps, and rubella (MMR) vaccine, the numbers have been dropping slightly over the past few years. They say that as soon as vaccination rates fall, old diseases re-emerge and this is why measles outbreaks are occurring across Ireland and Europe. In terms of symptoms, measles infection typically causes a rash, fever, conjunctivitis (red eyes), cough or runny nose with the rash usually starting four days after the other symptoms. Measles infection can have serious complications such as pneumonia, seizures and encephalitis (inflammation of the brain). One to two people out of every 1,000 who become infected with measles will die.